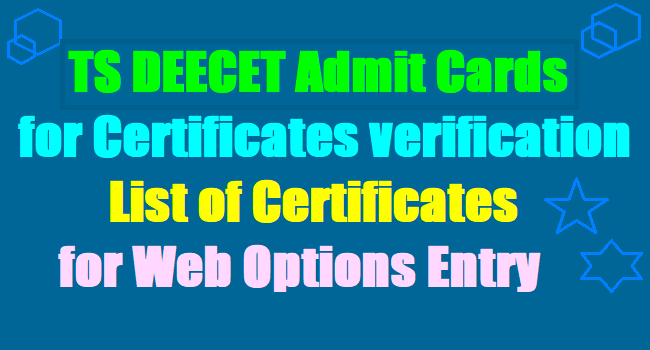 Download TS DEECET 2017 admit card for verification & List of candidates for Verification DIET wise/ TS DEECET 2017 Admit Cards download for Certificates verification, List of Certificates, Admit Card for Verification of Certificates, TS DEECET Web options: Telangana State Diploma in Elementary Education Common entrance Test (TSDEECET - 2017) merit list and results have been declared on the official website of TSDEECET 2017. The TSDEECET 2017 results(rank cards) are available on Tsdeecet.cgg.gov.in. TSDEECET 2017 is conducted by DSE Telangana for candidates who intend to take admission into 2 years Diploma in Elementary Education (D.EL.Ed) in Government District Institutes of Education & Training (DIETs) and Private Elementary Teacher Training Institutions in the state. The candidates are advised to check the TS DEECET 2017 website for further details about counselling. "The Ranks assigned in this Merit List are only tentative as they are based on the data submitted online by the candidates and hence are subject to change as per the 'Physical Verification of Certificates' to be caused shortly," said the results notification. Counselling date and time, Venue and list of Documents details are available in the Candidates Admit Cards. So, Candidate should download the TS DEECET Admit card from the Official Website and attend the certificates verification with the Original Certificates at GOvt DIETs on mentioned the date. All the candidates who have qualified in the TSDEECET 2017 are hereby informed that they should attend to the session for 'Verification of Certificates' at the District Institute of Educational Research and Training (DIET) concerned on the date and time given on their 'Admit Card for Verification of Certificates' to be downloaded from the website www. tsdeecet.cgg.gov.in on 04.07.2017. The candidates shall compulsorily attend the session for 'Verification of Certificates' along with all the 'Original Certificates' given on the 'Admit Card for Verification of Certificates' failing which they shall not be allowed to submit their options for web based selection of colleges for allotment of seat in D.El.Ed. for the year 2017-19 batch. TS DEECET student's certificates verification should be started from the 11th to 15th of this month for admission into D.Ed course. The students who are got ranks in the DEECET have been ready with their original certificates before 4th of this month. So, Candidates should download the Admit Card from the Official Web portal and attend the certificates verification along with required documents. The State Council of Educational Research and Training (SCERT), Telangana, has released a notice regarding Diploma in Elementary Education Common Entrance Test (DEECET) 2017. Candidates who have appeared for this exam should note that the Certificates verification will be held from July 11 to July 15 this year. The verification will be conducted by the District Institutes of Education and Training (DIETs) of Mahabubnagar, Vikarabad, Hyderabad, Havelighanapur, Nizamabad, Adilabad, Karimnagar, Warangal, and Nalgonda. The date, time and venue for each candidate is available on the candidates’ admit cards which can be downloaded from the official website of the exam (tsdeecet.cgg.gov.in). It is hereby informed that Sri / Smt / Kumari (......................) S/D/o (..............................) who has appeared for TSDEECET 2017 conducted on 17-JUNE-2017 with Hall Ticket Number (.....................) has been assigned rank (...............) in the Category of ENGLISH/TELUGU Medium. The rank assigned is based on the marks secured in TSDEECET 2017 and the personal details submitted by the candidate in the online application form for appearing at TSDEECET, 2017. Hence, She/he is requested to attend the session for verification of certificates at the District Institute of Education and Training, on 12.07.2017(9.00 AM) at DIET WARANGAL along with the documents shown at (I) below for confirmation of the personal details and eligibility for admission into D.El.Ed. programme for the year 2017-18 through web based admissions to be notified shortly. Confirmation of Eligibility for admission is further subject to the Terms and Conditions mentioned at (II) below. 1. Pdf of ONLINE application of TSDEECET 2017. 2. Hall Ticket of TSDEECET 2017. 4. Certificates of Qualifying examination (Intermediate or its equivalent ) as submitted in the ONLINE application. 9. Special Category certificates issued by officials mentioned in G.O.Ms.No.10 SCHOOL EDUCATION (Prog.II) DEPARTMENT Dt.12.04.2017 for candidates claiming admission under quota of reservation for Special Categories (Defence Personnel or their children and spouses, NCC, Rashtrapathi Awardee Scouts and Guides, Sports &Games). disabled candidates and Rs.1,00,000 in respect of EBC candidates claiming exemption of fee.